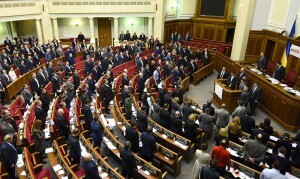 The voting of the coalition parties together with the remnants of the Party of Regions is an alarm that the “European Ukraine” coalition begins to fade. This was stated by Deputy Chairman of the “Samopomich” Union faction, Chairman of the Committee on Combating Corruption Yehor Soboliev. “It began with the vote for the appointment of Viktor Shokin to the post of Prosecutor General, when, instead of the entire coalition’s voting for the election of the Prosecutor in an open competition, the missing in the coalition votes were just supplemented by those of the Opposition Bloc. Now this is repeated even more often. Yesterday was especially revealing,” he stated. The deputy notes that misunderstandings occur more often, for example, there is no common vision as for the law on elections, the anti-corruption policy, transparency in appointments and changes to the Constitution, in which the mechanisms for usurping power are being laid down. “We do not want to sanctify the transformation of Petro Poroshenko into Viktor Yanukovych, because it is a road to nowhere, which will eventually lead to new Maidan,” stated Soboliev. The “Samopomich” Union faction intends to hold a discussion with the electorate in order to get out of this situation. “After all, there is the risk of repetition of 2005, when the “orange” authorities quarreled among themselves. But there were no such state threats that exist now, there was no war. On the other hand, to imitate the existence of a coalition – at the time when the key decisions are made together with the representatives of the old regime – is not right. Therefore, we will talk about this with people, will consult the constituents and will look for solutions,” said the MP.